The Kizer Gemini, a production version of the famous Jasmine, came out a few years ago to much fanfare and excitement, it was a chance for everyone that wanted a piece of Ray’s designs to be able to get it, at a price that would encourage them to put the knife to use. Kizer also has been making ripples in the EDC cutlery world, largely because of the fact that they seem to have mastered the ability to partner with custom knife makers and create extremely high quality versions of their knives. They’ve successfully done this with a number of notable makers including Matthew Christensen, Sheepdog Knives, Mikkel Willumsen, and a handful of others. Let’s get into some specifics. The Gemini has an overall length of 7.25″, a 3.125″ blade, weighs 3.6 ounces, and is made in China. Kizer makes a more affordable Vanguard series version of the Gemini. Ben Schwartz reviewed that one in 2016. And although this review is of the lefty version, it just as easily applies to the regular Gemini. The only difference is that the knife has been “mirrored” and the lock is now on the other side. The Gemini has a traditional “leaf” style drop point blade. Very similar in a lot of ways to some of the popular offerings from Spyderco. This blade shape excels, in my experience, for general EDC use. The full flat grind peels layers away when you’re slicing through food or other materials, it’s easily sharpened without any tricky recurves, and the 3” mark is right in my sweet spot for daily carry. S35VN steel seems to attract a little bit of controversy, my experience with it has been pretty good however. It takes a good edge on my Wicked Edge, and will hold it through a lot of work (in particular a lot of cardboard boxes). As an aside, I think that sharpening your own knives can be a good exercise in understanding how steel preforms under wear. Lots of people talk about wear resistance, toughness, and edge retention but I have found that these characteristics present themselves best during sharpening. Kizer stonewashed the blade on the Gemini. Stonewashing comes in many flavors, this one is very similar to the stonewash CRK uses on their knives. It repels wear, and looks really sharp (ha) over time. The handle is contoured Titanium, that have been blasted to a satiny matte finish. The handles are rounded (kinda like a river stone) to be comfortable in hand. There’s something to be said about the knife being a little slippery but its a tradeoff in my opinion. The handle’s design is simplistic, flaring out towards the pivot to contain the mechanics, and tapering as it moves backward. The spine of the knife rises up a bit to create a very effective palm swell when you grip it. There is a negative angle on the handle that descends down into your grip, between that and the choil formed by the flipper tab when opened the grip is pretty firm and stable when the knife is opened. With the knife closed the pocket clip acts as a nice guide to rest your fingers on when you flip it open, doing this helps keep your hand off the lockbar. The clip that debuted on the Gemini was a (frankly) cheap bolt on bent Ti spring clip. It was a real speed bump visually for me on the knife. 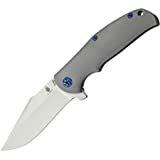 In the newer iteration Kizer has created a milled Ti clip that compliments the design very well. It’s mounted with two screws to the lock side and leaves roughly half an inch visible when it’s in the pocket. I want make an important point when it comes to a knife’s pocket clip. You likely use the clip more than you use the blade. It’s what holds your knife in your pocket and keeps it from falling out. While doing this, the clips also have to be trim enough to not catch on anything, rounded enough to not cause a hot spot when you use it, and attractive enough to not completely mess up the lines and aesthetics of a reasonably expensive knife. I’ve seen and handled the first generation of Kizer Gemini, the original clip was really awful at several of these points, but the updated clip solves those problems. The Gemini is a titanium frame lock flipper, the tried and tested configuration. One of the things that stands out about Laconico’s custom pieces is their flippability. The knives I’ve owned from Ray have been smooth, with perfect detents, and excellent lockup. The Gemini is no different. Kizer incorporated a steel lock insert on the Gemini to ensure lasting lock strength and to guarantee that there won’t be any lock stick. 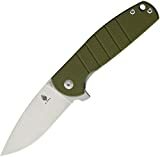 The steel lock bar insert trend in production knives is an interesting one to me, in theory it’s the best way to give a frame lock the longest life possible. Late lock up typically occurs as the harder steel tang on a blade rubs against the softer titanium lock face, the blade side of the frame lock over time grinds away the surface of the lock bar’s lock face. Replacing the Ti side of the lock with steel prevents this, it also prevents galling (lock stick). Additionally the steel insert acts as an over-travel stop preventing you from hyper extending the lock bar when you unlock it. One of the things that always stood out about Laconico’s custom knives is their flipperability (That’s a technical term we use in the industry to describe how well a knife flips. -Ed.). Kizer employed a similar caged bearing system in the Gemini to ensure smoothness and ease of opening. It’s a tried and true method, and Kizer executed it well. So, to wrap up the Lefty Gemini in a nutshell, I think it’s a great value. You’re getting a full titanium, S35VN, steel lock-bared, knife. The fit and finish is excellent, and it’s a great way to get introduced to Laconico’s work without spending custom knife prices. It’s also worth commenting on the left handedness that Kizer has embraced. Being lefty was what pushed me into buying custom knives, I didn’t like having to adapt myself to use production knives. Whenever I see a company that offers a specifically left-handed option, I try to at least buy one to support that gesture. If you’re left handed, I encourage you to do the same, and if you’re right handed… Well, the Gemini is still a great choice. I recommend purchasing the Kizer Gemini at BladeHQ or Amazon. Please consider that purchasing anything through any of the links on this website helps support BladeReviews.com, and keeps the site going. As always, any and all support is greatly appreciated. Thank you very much.